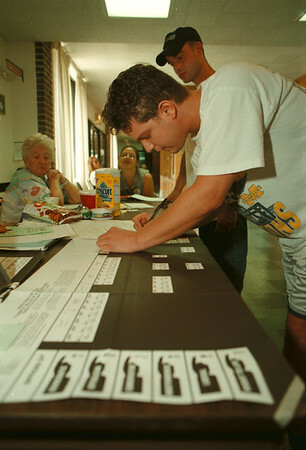 98/09/15 Primary Vote - James Neiss Photo - Chris Qualina of Beattie Ave. , foreground, and brother Anthony Qualiana, back with hat, both filled out ballots for todays primary. They were new residents and had to do it by hand. Back, L-R are Elections inspectors Amilia Scirati and Lisa Windnagle and were watching over things at the Board of Education Building.